Pain can be caused by a variety of elements, as a direct cause of injury or sprains. Some pains relate to stress and some to more serious pathologies. 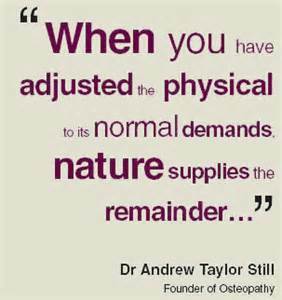 Osteopaths are skilled health practitioners. On your first visit a full case history will be taken with regards to your symptom picture as well as your medical history in case there is a connection. You will then be assessed in terms of mobility / tenderness within joints and muscles, as well as having neurological tests relating to your problem A diagnosis is reached and the appropriate treatment given. Osteopathy is a safe and natural therapy that offers a gentle and effective way to encourage movement back into joints and to increase the health of muscles, easing pain. In addition, osteopaths are able to give advice about posture and how to correct it by prescribing exercises that will help to maintain the body’s natural strength and balance. A wide variety of problems that wouldn't normally be associated with the musculo-skeletal system can be treated as osteopathic care improves the functioning of the whole body, circulation and the nervous system. Why not get in touch to find out whether osteopathy may be able to help you?